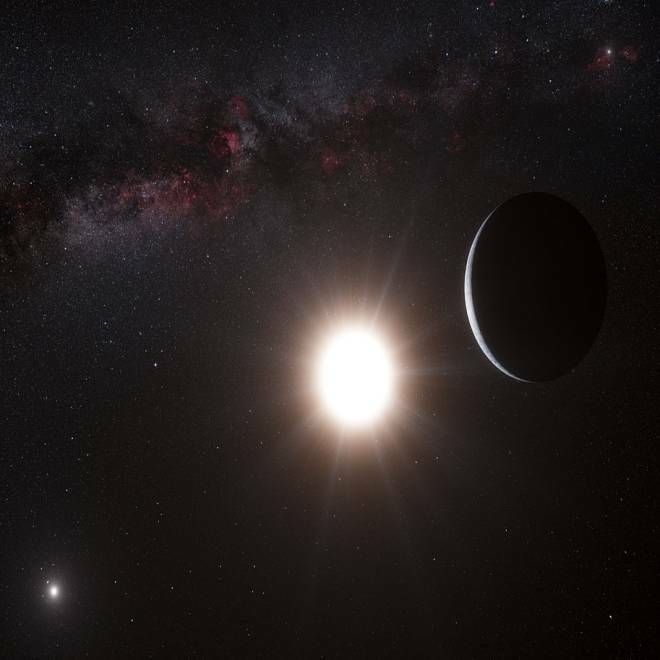 An artist's conception shows the planet orbiting Alpha Centauri B, a member of the triple-star system that's closest to Earth. Alpha Centauri B is the most brilliant object in the sky, with Alpha Centauri A at lower left and our own sun visible as a bright speck at upper right. Chances are that no one alive today will ever travel to Alpha Centauri B b, the boiling-hot, Earth-scale planet detected a mere 4.37 light-years away, but that doesn't mean we have to put off planning for the trip. Even though this particular planet isn't habitable, there might well be more than one reason to take a close look at the star system. "If you have one planet that's stable there, there's a good chance that there are other planets, too. That would be really exciting, to have it so close, even though it's really far away," said Dirk Schulze-Makuch, an astrobiologist at Washington State University who's a co-author of the e-book "How to Develop the Solar System and Beyond." As the late science-fiction novelist Douglas Adams once said, space is vastly, hugely, mind-bogglingly big. That definitely applies to the distance between the sun and its closest stellar neighbors in the Alpha Centauri triple-star system. The fastest spaceship ever launched, NASA's New Horizons probe, will require nine years to get to the dwarf planet Pluto — and Alpha Centauri is more than 6,500 times farther away. The twin Voyager spacecraft are just now approaching the edge of our own solar system, 35 years after they were launched, but at their current velocity it would take them 70,000 years or so to go as far out as Alpha Centauri. This ESO video shows an imaginary journey from Earth to the Alpha Centauri system. The only hope is that next-generation propulsion technologies could raise the top speed and reduce the travel time to the scale of a civilization's lifetime, if not an individual's lifetime. And that's not easy. "The amount of energy that's needed is usually the part that catches people by surprise," said Marc Millis, founder of the Tau Zero Foundation and a visiting scholar at the Ohio Aerospace Institute. Forget about warp drive: For now, let's talk about physics we actually understand. Because of the way propulsive energy scales in relation to distance, you'd need an engine a million times more powerful than Voyager's to bring the travel time to Alpha Centauri down to a human time scale, Millis said. That's such a tall order that even Kim Stanley Robinson, who writes about routine interplanetary travel in his latest novel, "2312," has pooh-poohed the whole idea of interstellar flight. "'Beyond the solar system' is too far away," Robinson told Space.com in May. "It's a joke and a waste of time to think about starships or inhabiting the galaxy. It's a systemic lie that science fiction tells the world that the galaxy is within our reach." Schulze-Makuch, however, hasn't given up hope. He notes that interstellar propulsion was one of the big themes at the Defense Advanced Research Project's 100 Year Starship Symposium. "It was pretty clear that we can get up to 10 percent of light velocity, using solar sails. You'd have to wait quite a while, but you're constantly accelerating," he said. Millis agreed that light-sail technology was one of the most widely suggested avenues for interstellar flight. Such a space-sailing spaceship would be propelled by the pressure of photons — perhaps from the sun, but more likely from a super-powerful laser aimed at the sail from a station on Earth. Another avenue might be to use nuclear fission or plasma drives to blast the starship outward at an accelerating pace. Assuming that it's possible to get to 10 percent of light speed, Millis said the first traveler to Alpha Centauri would almost certainly be a camera-equipped robotic probe. "At our level of prowess, including the things we think we can do but haven't really tried, a probe is about the only thing you can send," he said. The electronics would have to be robust enough to survive somewhere between 45 and 200 years of traveling — which Millis thinks is within the bounds of believability. The first intelligent entities to travel from Earth to other stars will probably be artificial androids built to last for centuries. If it ever gets to the point that humans journey to other stars, they would almost certainly have to live for generations within a huge, self-sustaining habitat. One of the most popular options is to hollow out an asteroid, place an artificial ecosystem inside it, give it enough of a spin to provide artificial gravity, and somehow send it speeding on its way. Such a concept has been around since the 1960s, and in the novel "2312," Robinson fills the skies with such craft to carry his characters from destinations ranging from Mercury to Pluto and beyond. It could take 200 years or more to send out the first true starships — but along the way, there will be plenty of discoveries like this week's detection of Alpha Centauri B b to push us along. "The roadmap that we have takes a grand perspective, with the objective to scout out our own solar system first, put a permanent human presence on Mars, look at asteroids, and really work first on our own solar system before we take the next step to an extrasolar planet," Schulze-Makuch said. Will we humans ever get the chance to follow through on that roadmap? Feel free to weigh in with your comments below. In a statement issued today, NASA's associate administrator for science, John Grunsfeld, praised the researchers at the European Southern Observatory who made the Alpha Centauri discovery . "For astronomers, the search for exoplanets helps us understand our place in the universe and determine whether Earth is unique in supporting life or if it is just one member of a large community of habitable worlds," Grunsfeld said. He noted that NASA's Kepler, Hubble and Spitzer missions have contributed to the search for planets beyond our own solar system, and that the James Webb Space Telescope would study exoplanets as well. "NASA is also studying two medium-class exoplanet missions in our Explorer program, and in the spring of 2013 will select one of them to enter development for flight later in the decade," Grunsfeld said. Those missions are known as FINESSE and TESS. The Alpha Centauri discovery has turned the spotlight once again on the Exoplanet app for the iPhone, iPad and iTouch, developed by Danish-born astrophysicist Hanno Rein. The app keeps track of more than 800 extrasolar planets, and sends alerts when new discoveries are announced. Believe it or not, more exoplanets have been added to the list since Tuesday's announcement about Alpha Centauri B b. The new entrants include WASP-72b and two worlds detected by the Optical Gravitational Lensing Experiment, or OGLE. These giant planets range from about a tenth of Jupiter's mass to nearly one and a half times Jupiter's mass.